The notion of spring cleaning is a funny one -- aren't people cleaning at other times of the year? Still, anything that prompts a cull of the crap that piles up is welcome. Wardrobes in particular are a place where clutter loves to cluster. Don't let those inside-a-celebrity-closet shoots fool you -- no one really lives like that. While we can't all have walk-in illuminated fashion chambers, we can have some sort of order in which we arrange our clothes so they actually get more visibility and wear. Helpling offer these steps -- so crank the tunes and get your closet sorted. 1. Dump everything on your bed. Every last bra, the winter jumpers and all of those sad individual socks stuck right at the back. The aim here is for you to look back at your bed and realise you're holding on to way too many useless items. 2. Once every item has been removed take a cloth and cleaning spray and wipe over the surfaces. This will gather dust and is a great way for you to see how much space you have to work with. 3. Throw away all rusty hangers and shoe racks. Wire hangers ruin clothes with creases and stains so throw them away and invest in wooden hangers that will protect your clothes. You can buy good, cheap wooden hangers at any supermarket. 4. Reflect on how to best use your wardrobe space. Use a measuring tape to see how you can better make use of your space with storage boxes or zip lock bags. There is no limit to your creativity -- whether you need new hooks, shelving, racks or baskets -- a quick trip to a storage or hardware store will give you plenty of options. 5. Getting rid of what you don’t wear and keeping only what you do is possibly the hardest part of this whole task. The rule of thumb is, if you haven’t worn it in more than 12 months, donate it. If you haven’t worn it in six months, put it in the ‘maybe’ pile and if you haven’t worn it in more than three months, keep it, but put it where it’s visible so you remember to wear it again. 6. Addressing sentimental items is tricky. If you're unsure, it's recommended to take a photo so you can remember the item -- then give them to charity. Not only will you save lots of precious storage space but there are plenty of places where you can give them a second life and allow others to make memories. Consider upcycling unwanted clothes, too. There are plenty of apps and websites like Remoda, Gumtree and Ebay where you can sell goods -- or even go old-school and have a garage sale. 7. While you’re sorting the shoulder padded jackets from the skinny jeans, place them into categories. Divide them into 'Work/ Business', 'Casual/ Weekend' and 'Occasion/Evening'. If these categories don’t work, choose a few more to suit your lifestyle. The aim is separating your clothes into at least three distinctive groups. 8. Start sorting your clothes into colour and item piles within the categories you established in the previous step. Group pants together, t-shirts in another and jackets in another. This second tier of coding will help so much when it comes to putting everything back. 9. Now everything is sorted you can put your clothes back into your wardrobe. 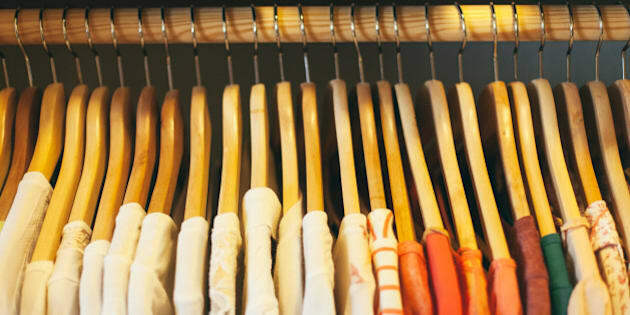 As a rule of thumb you should hang blazers, jackets, dresses, coats, skirts and dress pants -- and the rest can be folded. Anything that is silk or delicate should also be hanged and placed in a garment sleeve. Items for folding include anything cottons, denim or wool -- but make sure you stack them neatly in their appropriate colour and lifestyle categories. 10. Now for everything else. Set aside a couple of miscellaneous drawers for items that are too fiddly to go elsewhere in your closet -- things like swimwear, scarves and hats. Finally, place shoes with the toe at the front and with its pair, just like a store would. You’re always more likely to wear something if it looks good in your closet. Stack bags side by side to help maintain shape and if possible, keep them in cloth bags to stop dust gathering. Divide jewellery into categories -- necklaces, rings, bracelets etc. A good way to store accessories is in clear take-away containers.